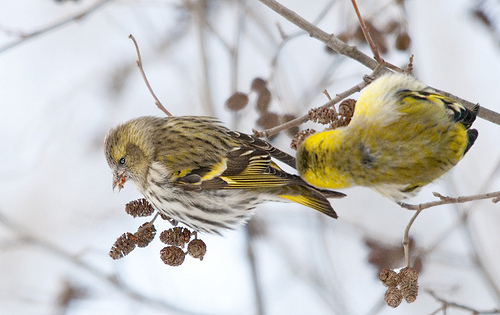 Siskins are birds that seek each other's company in winter. In groups of several dozen they can be found in large coniferous trees, looking for seeds and other food. 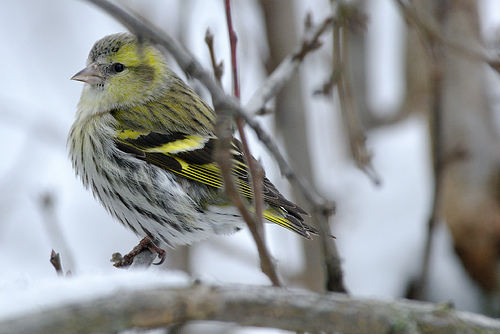 The Siskin has bright yellow stripes on the wings and a black crown. The Siskin is smaller and has much more yellow on the wings. The Yellowhammer is browner. The Siskin is much smaller and has a smaller beak. You will not often see the Greenfinch in large groups in a tree.